The Weathercock stands at the junction of Station Road and Weathercock Lane, on the Bedfordshire side of the border (just!). Of course, Station Road has only been called such since the railway station arrived in 1846, and to confuse things further, “Weathercock Lane” was usually called “Aspley Road” up until about 1935. 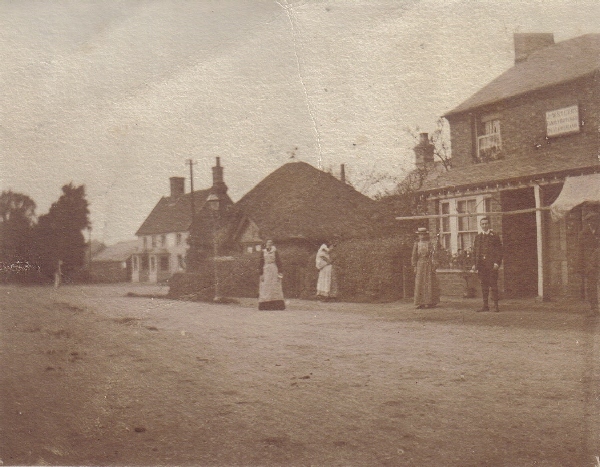 Also, before the railway came, Cranfield Road used to carry on directly from the sharp corner by the pedestrian crossing of the railway, and meet Station Road near the Weathercock. It was turned to run along the tracks to where it meets Newport Road now to avoid having to have two road crossings so close together when the railway was built. 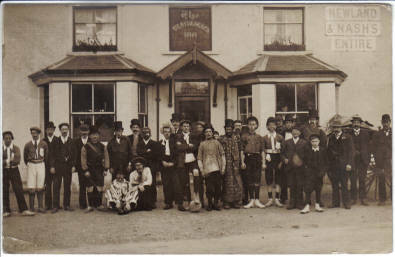 The late Arthur Parker researched the history of this inn in the 1970’s. The work below began as his notes, but I have assed in many newspaper stories and other facts as I have found them. I only saw one story related to it in all the “Woburn Reporters” newspapers I searched through at Bedfordshire and Luton Archives. I think it concerned a lady tramp who tried to use some stamps she had stolen from Woburn Sands Post Office as cash at the bar. I was looking for Fir Tree Inn news articles at that time, and regret I did not make notes about the incident, but I think it was sometime around the 1930’s. The paper stated that it was the first event at the Weathercock Inn that had made the news that anyone could remember! The images used here come from my own collection and that of the Woburn Sands District Society. Arthur Parker:- “One naturally expects to find public houses in the centres of habitation, but what would one expect in a place like Hogsty End, where, in 1740, it is recorded there were 12 houses and not many more than another 30 scattered over the Heath to Longslade. For a sprawling 40 houses, two or three inns seem unlikely, but at the end of the eighteenth century we had four licensed houses. It must not be overlooked that the inns of those days catered especially for the traveller – and was not Hogsty End on the turnpike road, which carried coaches from Holyhead, Chester, Manchester, Leicester, Northampton, Wellingborough and other places, on their way to London? So it is not surprising to find our first inns on this much used road. They were not big enough to serve the coaches, most of which went through to and from Woburn (which had 20 inns) and was an important posting station. Our inns most likely catered for the waggon traffic, carrying goods and the coach baggage. The earliest record of a ‘local’ comes from old Assize accounts, which tells of drinking at Hogsty Houses, but at which inn it does not say. Not far away was the Friends Meeting House, sometimes known as Hogsty House, and this leads me to think the writer in using that term referred to the nearest inn, which was the Swan. It stood at the crossroads and was a very likely house to be used by a stranger. The Weathercock is one of the oldest inns of Hogsty End, and may be the oldest, but why it was built in its then isolated position is hard to explain. It changed hands a few times in its early days, and from the old Hoare Estate deeds of Wavendon, one gathers the following information. 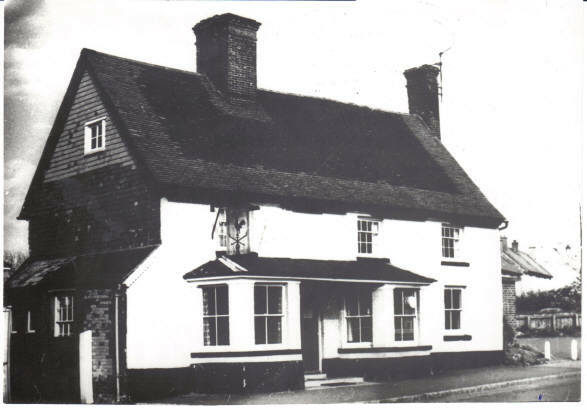 The first reference to the property is in 1662 when a lease for 999 years at a peppercorn rent was granted by Richard Newman, a carpenter of Ridgmont, to Robert Burrowes and his intended wife, Jane Ambridge, both of Aspley Guise. It is from this ownership at the name “Burrow’s Close” came to be used in the years that followed, and which has been revived to give a title to the present building estate. The property was then described as “a parcel of sward [land covered with grassy turf] ground” of 5¾ acres, in Newman’s occupation. 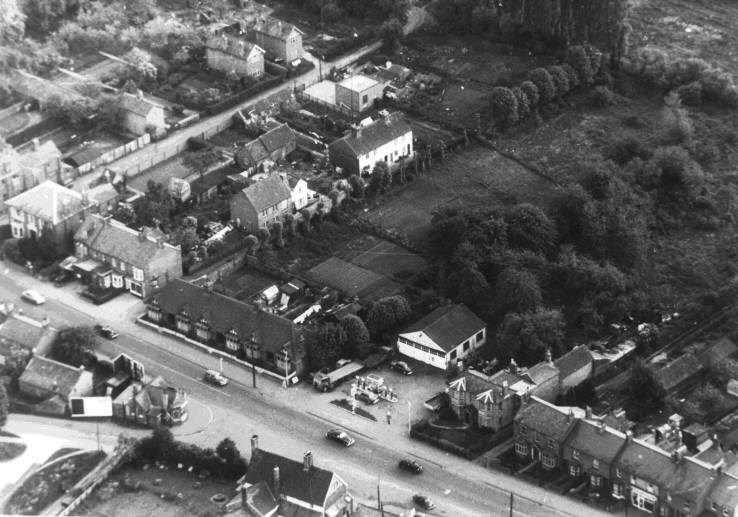 “Whereas there was lately built on the said parcel of sward ground a messuage with stables and other buildings now standing thereon, in the occupation of Ralph French, known as The Thatched Inn”. The date of the deed is 10 May 1758, and it states the property is vested for the remainder of the lease in Richard How, senior, and that he transfers it to his son, Briggens. In those days new buildings were a rarity, and anything erected within the previous, say, fifty years was described as “lately built”, so the term must be construed in a very wide sense. The term “stranger” and the name “Wilbee” make interesting reading, for in the above quoted deed of 1758 the occupier of the windmill and its house and the surrounding fields was John Wilbee. Was Ann a stranger, even though the events were fifty years apart? There is no information as to who built the inn. It was no doubt erected to serve both as hostelry and farmstead, as there were extensive outbuildings, most of which survive, and for many years much of the surrounding land was farmed from here. One can hardly imagine Quaker How building a public house, and it is more than likely it was established by Burrows soon after he bought the land. A servants fair wasn’t for house servents, this was for farm labourers. Labourers hired on to a farm for a year at a time. If they proved hard workers, of course, the farm would want to hire them again the next year, but if they were idle, they wouldn’t get picked. It shows that the Weathercock name was being used ealier than Parker thought, but it seems that several names were in use at the same time. In 1785, a Mr Paterson published an atlas of road maps, one of which showed the route from Hockliffe to Manchester, passing through Hogsty End. The only inn marked is a ‘White Hart’, where the Weathercock now stands. …but was Mr Richards the licensee, or just a farmer having his goods sold at the Weathercock? “Bedfordshire Freehold Estates, Tythe-free, a small Modus excepted, settled by an Act of Parliament. 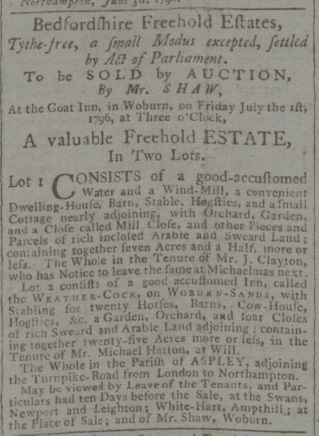 To be sold by auction By Mr. Shaw at the Goat Inn, in Woburn, on Friday July the 1st 1796 at three o’clock, a Valuable Freehold Estate in two Lots. Lot 1. Consists of a good accustomed water and windmill, a convenient dwelling house, barn, stable, hogsties and a small cottage nearby adjoining, with orchard, garden and close called Mill Close, and other pieces and parcels of rich inclosed arable and sweard land, containing together seven acres and a half, more or less. The whole in the tenure of Mr J. Clayton, who has notice to leave the same at Michaelmas next. Lot 2. 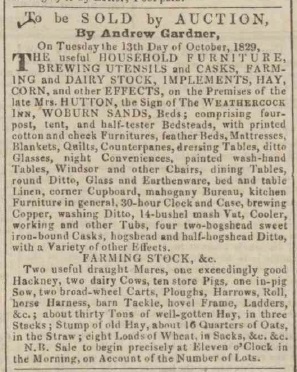 Consists of a good accustomed inn, called The Weathercock, on Woburn Sands, with stabling for twenty horses, barns, cow house, hogsties and co., a garden, orchard and four closes of rich sweard and arable land adjoining; containing together twenty five acres more or less, in the tenure of Mr Michael Hatton, at will. Parker:- “The Hoare family had been building up its estate from the early days of the century, but it was only now that they bought land from the railway to the top of Weathercock lane, and covering the present Golf course. James had probably inherited it from his parents, as a Michael Hutton had left “the Weathercock public house at Hogstyend” to his wife Elizabeth and un-named children in his will of 1808, although I do not know what year Michael died. Parker:- “So far as the building is concerned it is interesting to know that it started with a thatched roof, but like many of its contemporaries, the thatch was replaced by tiles, no doubt for the sake of economy. The beer cellar was drained through (or under) the farm buildings and across the meadow land “Swallow Furlong” into the roadside ditch, discharging somewhere near the turning of the old road to Cranfield. An alternation in the building eventually brought an advantage certainly not thought of at the time. At some period bay windows were added to the front, and as the county boundary ran along the face of the house, the bays stood in Bucks. Another local news report give sthe name of Basil George Martin as landlord, when he was sued by a motorcyclist after a collision near Battlesden. This was in a June 1926 Beds Times. Since then, the inn has been transferred through Wells and Winch of Biggleswade, to successors, Greene King, which it remains up to the present time. The Weathercock featured on a sheet of First Day Cover stamps in March 2001, with their own special frank. The story of the inn being in two counties has also been used by local musician Graeme Meek, who recorded “More Time, Gentlemen, Please” in 2006, a folk song about the drinkers moving to a different room of the inn when time was called, as the bar in one county had longer opening hours than the bar in the other! One of the Fir Tree regulars in the 1970’s – 1990’s was Charlie Cole. 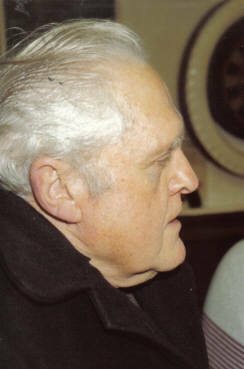 He was an ex-Naval Stoker, who had once run the Weathercock, and his favourite story about the pub was how he charged extra for ice and lemon in drinks as he thought it was “poncey” and meant he had to go to the kitchen to fetch them! To this research I can add Bedfordshire and Luton Archives compiled list of known licensees, to which I have added some others from other sources. Please note that this is not a complete list.